Welcome to this month's Stamp of the Month Blog Hop where we are featuring the September set called: Limited Edition. If you came from Debra's blog- you are headed in the right direction.... but if you are just stopping in- that is fine too- just follow the blog around and you'll end up right back here. You'll find the next blog in the loop at the end of this post. Now- a look at the stamp set. I'll be honest... there are other sets I LOVE...and then there's this set... I don't love it. I stamped it many times in different arrangements on scrap paper to see if anything caught my eye. I would probobly use it on a layout and love the results, but I was not in a scrapbooking mood and didn't want to scrapbook my precious photos when I'm not in the mood to do so. So, after much stamping and debating... I came up with a combo that I LOVE! .Since I was not in a scrapbooking mood... I decided to pull out one of the MANY containers I have stashed away for future projects. Now... I have not done a lot to this container... Some simple ribbon and tag. The "Little Moments Big Memories" is not actually from the stamp of the month- But is was the perfect sentiment for this over all project. That sentiment came from the new C1468 Winter Joy set. All other images are from the Stamp of the Month. Over the years I've seen a lot of projects similar to this- where you record memories of things that happen during your children's younger years... their first tooth, first haircut etc. I never really worried about writing those things down because I was so caught up in my scrapbooking that I just scrapbooked the events as they happened. Now that I have a school aged child and a 2 year old... I've suddenly fallen way behind!! I'm afraid that by the time I'm ready to scrapbook certain events- I won't remember the memorable moments quite as well. And what about the really important memories that you don't have photos for- the things that are funny enough that you want to remember-even if they don't land a page in your album? So... in comes my use for this stamp... a memory bucket! I used my Cricut Art Philosophy cartridge to cut a stack of journal blocks (2" rectangles to fit this stamped image) and stamped the lines in black and words in Tulip. Here are the first few memories... just from the last few weeks that I really wanted to record. Such as: This one shown- My husband filled my daughter's soccer ball with air Sunday night since it was totally flat. And guess what- it exploded the next night...literally in shreds! So funny!!! Or what about last week when I told my 2 year old that I loved him... and he told me he loves his shoes! Those are the fun times that I want to remember...the stories I want to share with my kids when they are older. I have some more of these buckets in my stash and will be making up some "baby memory" kits for an upcoming craft show. 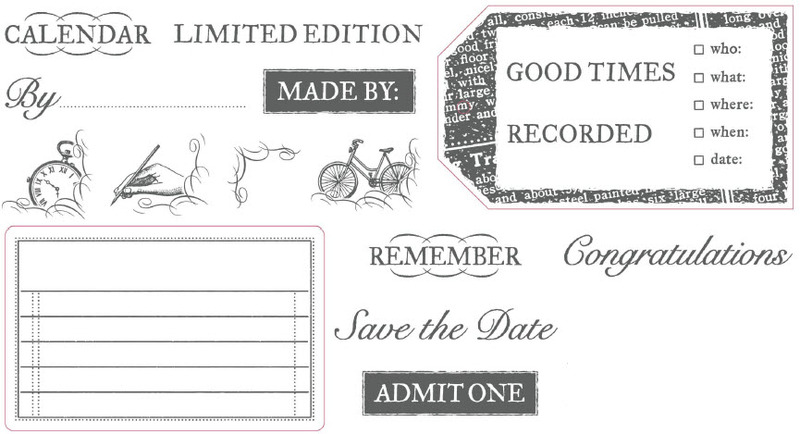 Hope you are inspired to record your memories using the Limited Edition stamp set. Next on the hop- Leanne! Go visit her blog for more ideas. If you are wanting to purchase this set - visit my site here- You can choose to purchase for $17.95, or for only $5 with a purchase of $50 or more. The free Pair a phrase set is still available for orders of $75 or more. I love this use for the stamp set! I have found that recording things on journaling tags as they happen is much easier than going back and trying to remember. Tfs this terrific idea and use of these stamps. What a fabulous idea! And so needed. I love the idea and I think it would make a great baby gift!! This is such a great (and cute) idea! I love this idea. I might have to start this with my kids now. Thanks for the great project idea!! I've seen this idea and always wished I had done something like this when my daughter was little. Great use of the stamp set this month! Enjoy those little moments. What a WONDERFUL idea for using this stamp set! I have a baby shower to attend...and this is a great gift idea for the new mom to jot down thoughts...whether she scrapbooks or not. And...with the Cricut Cartridge to cut all the pieces, making a bunch of these is a piece of cake. Thanks for playing and coming up with a wonderful idea.